Public art is art that is installed in a place where everyone has free access to it. It is meant to decorate and even define the area of its location; to create a sense of place. Some public art is community art; it relates to and reflects the community where it is situated. It is often created by local residents collaborating with professional artists. So, community art is public art that is made by the people who live where it is. In a small corner park on Vaughan Road is an artwork called the Community Totem, created by the people who live around there. The installation grounds that little park in time as well as geography; in depth of history and in breadth of the local population. 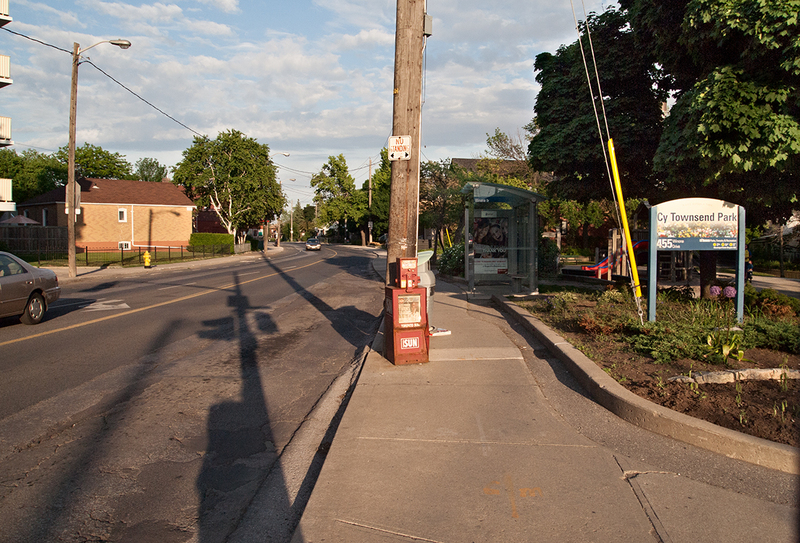 The Totem is comprised of three tall posts facing Vaughan Road opposite a low, circular retaining wall which outlines it and offers a place to sit. 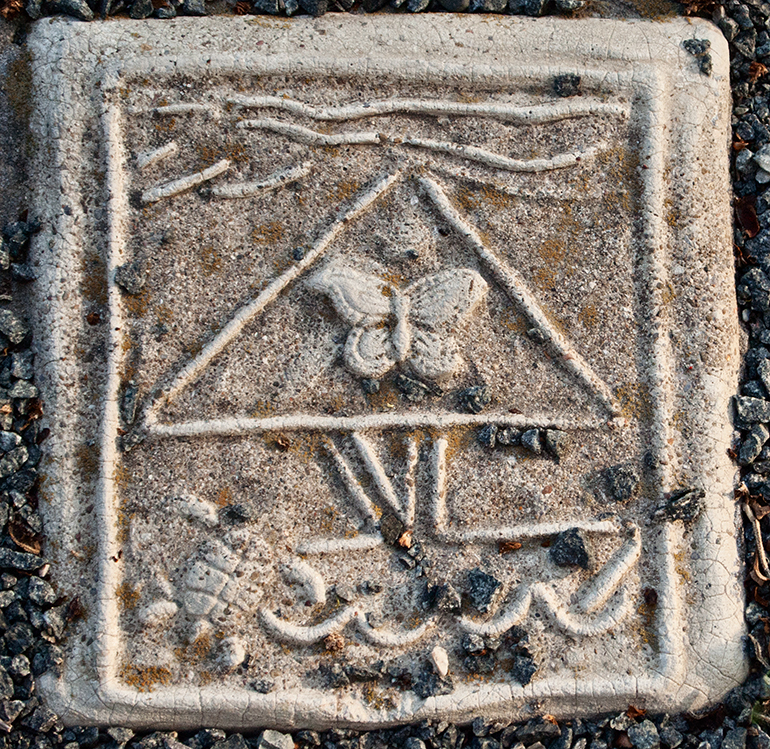 Within that circle, hand-made and decorated tiles are laid out in four sections around a scored circle at the center, oriented to the four directions. Tall trees shade the circle and flowering plants and shrubs surround it. It suggests gathering, invites reflection and emanates a sense of connection and ‘groundedness’. The Community Totem is a project generated by Art Starts, an arts organization that brings together professional artists and local residents to collaborate in creating public art projects which reflect their community. 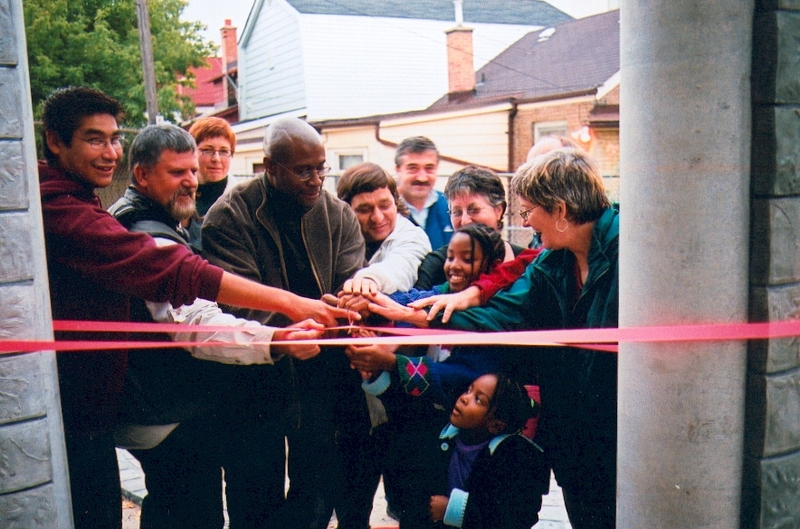 In 1998, Arts Starts’ idea was to have a millennium project that reflected this diverse Oakwood neighbourhood by having between 300 and 500 community residents participate. They began with the notion of creating a marker in a community comprised of people who share a geographic space, yet may not share a common language, interests, politics or religious beliefs. It developed through many iterations among the project organizers until the intention was refined and made site-specific. The organizers were adamant that the art be a collective expression. Not an artwork by a professional artist simply presenting local residents with a representation of themselves that they could look at – but something that was a collaboration between artist and residents and made together. A creative team of four carried out the project. Mira Coviensky, Art Starts Program Director, and John Devenish, Project Manager, hired lead artist Reinhard Retzenstein, who had experience with community art and was established in public art. An immigrant himself, Reinhard was also interested in the flavour of this neighbourhood. He brought on board Lois Dellert, an artist expert in working with concrete and a skilled workshop facilitator. John Devenish is a guy who gets involved, wherever he is. He relishes getting something going and getting people together to do it. 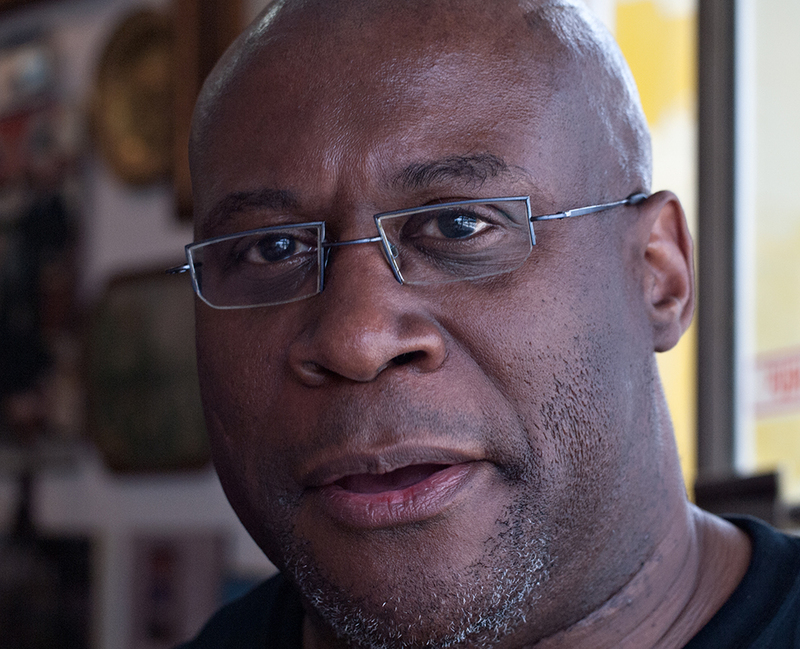 He was project coordinator and arts animator for the Community Totem – basically making sure all necessary connections were made and followed up, including sparking interest in the neighbourhood. “I always think, when you’re going to do something, make it big, make some noise. And one thing you know, if you’ve lived in this neighbourhood is, when you do make noise here, people come out to see what’s going on. And that’s a good thing; then they’re involved.” He feels a great attachment to his neighbourhood, brought up his son here and is convinced there’s no place like the former City of York. To him the idea of making a welcoming gate or totem was an expression of his pride and connection to the place as well as his assumption that others here feel as he does. “I wanted everyone’s hands in it.” He took great satisfaction in bringing the idea to fruition, getting it done. Making some noise, as he says. The artists conceived the overall shape and concept of the project. Then it was up to members of the community to create the individual tiles that make up the mosaic circle. 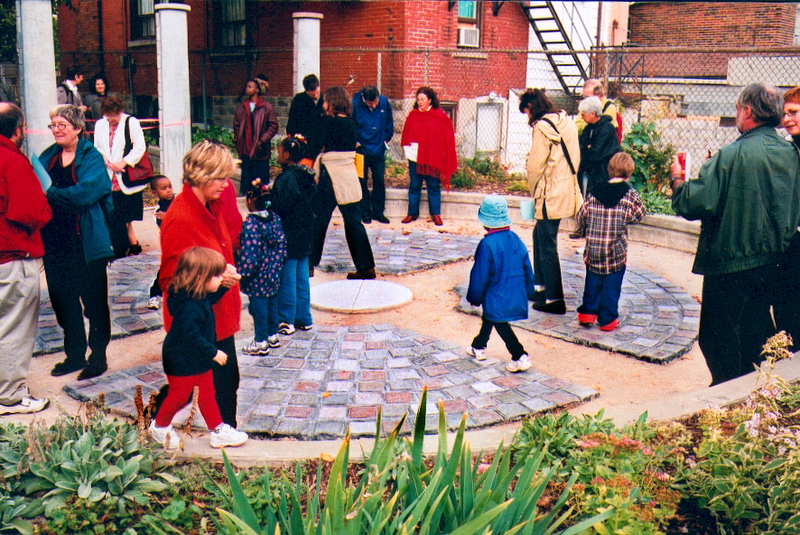 Local community groups hosted and participated in the tile-making workshops, including: Humewood P.S. Fair, York Health Centre, Art Starts, Oakwood Village Library, Na-Me-Res, Italian Women’s Theatre Group, Art Starts Summer Camp, the Canadian-Jamaican Association, St. Clair West Senior Centre, York Community Services, Junior Carnival and Vaughan Road Academy. Click here to see all the tiles. The stories of those who have come from the four corners of the world to live here lie side by side in an installation that is one unified whole. Together they have made a place. For resources used in the writing of this article, thanks to Art Starts and their current and former personnel, including Tamara Haberman, Mira Coviensky, Angela Lee, Lois Dellert, and Alison Bates. And for his stories, his voice and his patience, thanks to John Devenish.